On average, kids spend twice as long playing on screens as they do playing outside. Whether you call ’em PEE-can or PEH-kahn, they are one of the most sought after nuts around the globe. A cousin of the walnut, pecans are the only major tree nut native to North America. People love pecans for their versatility: They add a sweet, nutty goodness to breads and cereals, stuffing and spreads, salads and side dishes, entrees and desserts. At the same time, they bring a lot of nutrition to the table. Pecans contain healthy, monounsaturated fats like oleic acid, as well as antioxidants that support heart health by lowering LDL cholesterol and increasing the good cholesterol, HDL. Packed with fiber, pecans support healthy digestion and colon health. Some research shows that diets consisting of pecans (and other healthy nuts) can support a healthy body weight and even help people lose weight. Pecans are a good source of vitamins and minerals that support overall health, including B-vitamins, magnesium, manganese, vitamins E and A, zinc, iron, and folate. Your family can enjoy the natural, nutty sweetness of pecans as a snack (plain or roasted), sprinkled over yogurt or oatmeal, or sautéed with savory seasonings such as curry powder, sea salt, or paprika. Consider baking with pecans—from cookies to cheesecake and even homemade ice cream. When purchasing pecans, fresh is best and organic is even better. Look for pecans in the bulk foods section at a grocer that regularly “turns the stock.” Store pecans, and all nuts, in an airtight package away from heat, preferably in the fridge to retain nutrient content. It’s sweet. It’s nutty. And it’s oh so good. If you haven’t yet had pecan nut butter, you have to give it a try. The key to exceptional nut butter is the quality of the nut. Choose the fresh nuts stored in bulk and rotated frequently. Refrigerated, organic nuts are ideal. 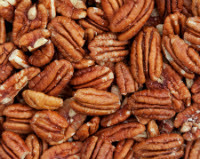 Toasted pecans blended with a food processor turn out scrumptiously smooth with maple undertones, without any added oil. A pinch of salt and a dash of cinnamon enrich the flavor. Try it on your favorite breakfast bread or whole grain crackers, or smoothe pecan butter over sliced apple. Pour into a small jar, seal it with a lid, and store it in the refrigerator for good measure. This pecan butter will keep well, refrigerated, for up to one month or so – obviously, don’t eat it if you see or smell any signs that it has gone bad. Zinc is present in a great variety of foods, such as eggs, seeds, nuts, dry beans, red meat, miso, dark turkey meat, dark leafy greens, and scallops. However, because there is evidence of mineral depletion in soils around the world, your holistic health practitioner may recommend a trace mineral supplement. A zinc supplement might also be recommended for people with a medical condition that affects absorption. Medical researchers are looking at how the body utilizes zinc and whether or not taking zinc can improve treatment for Celiac Disease, diabetes, thyroid function, heart disease, and other health concerns. In other research, a connection exists between taking certain forms of zinc and a reduction in the number of colds in a year, the number of missed school days, and the amount of antibiotics required in otherwise healthy children. A person’s need for supplemental zinc varies based on age, gender, and other health factors. There are several forms of zinc, but not all are appropriate for every person. For some people, zinc supplements can cause upset stomach or interfere with the actions of other medications. Also, taking too much zinc can have a toxic effect. Consult with your natural medicine practitioner before starting a zinc supplement. For millennia, physicians, and herbalists have found medicinal uses for all parts of the elder tree, including its wood, leaves, flowers and berries. Leaves were used in ointments to heal skin. The flowers and berries were made into infusions as a common treatment for colds and rheumatic conditions. Today, herbalists and holistic physicians commonly recommend elderberry for the wide variety of properties that can support the health of the young and old alike. European (Black) Elder (Sambucus nigra) is the species safely and most commonly used for botanical medicines. Note that the berries should not be eaten (or used) raw. They must be dried first or properly cooked at the peak of ripeness. Elderberries are rich in Vitamin C and flavonoids that act as antioxidants that protect cells in the body from damage and can help reduce inflammation. They have been used in preparations to treat colds, flu, and bacterial sinus infection. In studies, syrup prepared from the juice of elderberry has been shown to help decrease the duration of flu symptoms, including swelling in mucous membranes and congestion. Other studies have shown that elderberry extracts have antiviral properties and appear to have a role in inhibiting the replication of viruses. Elderberry can interact with other medications including those used to treat diabetes, asthma, and drugs that suppress the immune system. Before using an elderberry product for an adult or a child, check with your natural medicine practitioner to verify the integrity of the product and appropriate use. Under the guidance of a certified instructor, yoga classes for kids focus on building upon each child’s strengths while helping them ease stress and bolster self-esteem, cooperation, self-trust, and reverence for one’s inner world. These classes are for kids of all ages and typically use music, activities, and props to create a fun, interactive environment. The standard credentials for a children’s yoga teacher is completion of a 200 hour Yoga Alliance approved teacher training plus educational or practical experience with children. (If your child has special needs, that is additional qualification/experience you’ll need to explore). Ideally, the instructor has obtained CEUs or certification in teaching yoga for children. Before choosing a class for your child, ask questions about the teacher’s experience and certification. Also, observe a class and see the range of abilities being taught; trust your intuition about whether or not a class or a teacher is a good fit for your child. A children’s yoga teacher must be able to truly be present for a child just as they are, in the moment, and demonstrate acceptance that every child’s body does yoga differently. This empowers even the most ‘yoga clumsy’ child to gradually achieve a sense of fulfillment and self-efficacy that can carry from the yoga mat to other areas of the child’s life.